That's why you should go see this movie when it hits theatres in September. "Between 1968 and 1972, nine American spacecraft voyaged to the Moon, and 12 men walked upon its surface. 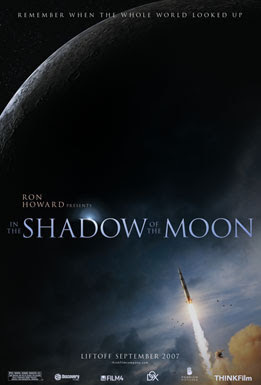 IN THE SHADOW OF THE MOON brings together for the first, and possibly the last, time surviving crew members from every single Apollo mission that flew to the Moon along with visually stunning archival material re-mastered from the original NASA film footage. The result is an intimate epic that vividly communicates the daring, the danger, the pride, and the promise of this extraordinary era in history when the whole world literally looked up at America." I would also highly recommend Ron Howard's other Apollo film projects, APOLLO 13 (which is well-known), and the lesser known (but more extensive and therefore much more valuable) mini-series produced with Tom Hanks, FROM THE EARTH TO THE MOON (1998). FROM THE EARTH TO THE MOON chronicles the entire Apollo development, in 12 episodes, from the dawn of the Space Race to the government's scrapping of the project in 1972. It is presented in dramatized form. If you have ever seen footage of the Moon landing, or a rocket taking off, and you got shivers, then you will greatly enjoy this series. Anyone who wishes to know initimately and directly the great achievements of our past, would be remiss to never see this series. I hope it's better than the Da Vinci Code! oh jesus and mary christ, well here's hoping the astronauts don't land themselves in any plotholes.